Airfix FW-189: The first model I painted with the colors mixed with white for "scale effect"
This is an interesting topic, and the subject of much debate among model builders. 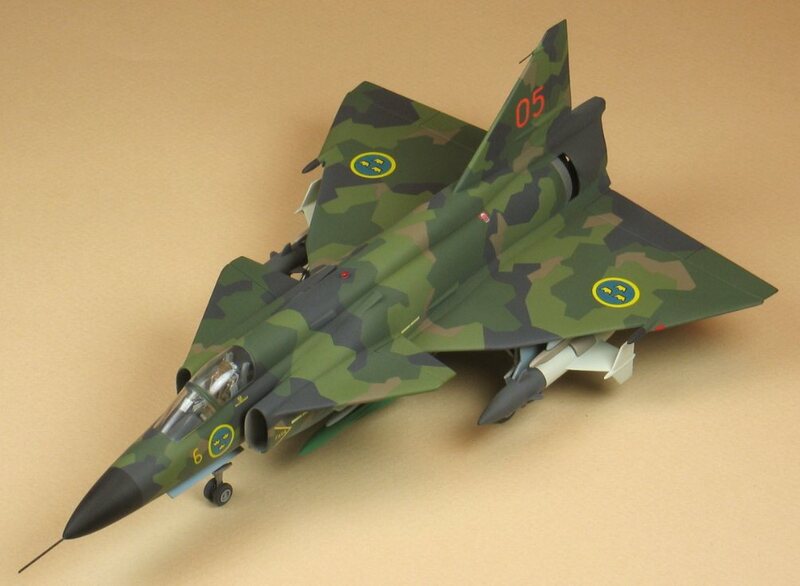 To begin the discussion: model builders generally buy model paints to paint their models. These paints are formulated by the paint manufacturers to match the actual colors of the real subjects (prototypes). This means that the paint straight out of the model paint bottle, when dry, looks as perfectly identical to the paint on the surface of the prototype as modern chemistry can achieve. For prototypes that exist in the present, this match is relatively easy to achieve, but even for historic prototypes no longer in existence, getting a model paint to reasonably match the original color can be done. Samples exist in museums and on preserved examples of the prototype. Color photographs can also be used as a guide, as long as care is taken to understand the age and nature of the photograph. If the prototype is so old that no samples exist, and it predates the invention of photography (a Roman Trireme sailing ship, for example), then the issue of matching a color precisely becomes academic, since who can then prove a model paint color is correct or not? Assuming that a model paint has been accurately matched to a prototype, some interesting facts become important. One such fact is that prototype paints were not universally uniform. If we consider U.S. Army World War Two olive drab paint for wheeled and tracked vehicles, for example, this paint was produced by many different paint manufacturers, over the course of more than six years. The official U.S. Army formula for olive drab varied over time, producing different shades of the color. The way in which the olive drab paint was applied to the vehicle (spray gun, paint brush, indoors, outdoors, high or low humidity or temperature, etc.) had an impact on the finished product. As a result, there was no single, constant, uniform shade of olive drab during World War Two. A particularly vivid account of this phenomenon was provided by a worker at the Douglas Aircraft plant that built A-20 Havocs. According to this man, because the components (wings, tailplanes, engine nacelles, fuselage sections) of the A-20s were individually painted as they were fabricated, the result when all of the components were assembled into an airplane resembled a patchwork quilt, rather than a uniform, monochromatic whole. Another interesting fact about paint concerns how rapidly the finish on a painted machine fades and weathers, when exposed to the elements. To continue with our olive drab example, even if it had been possible to somehow paint all U.S. Army vehicles with only one, perfectly blended supply of exactly uniform olive drab paint, the machines would have quickly altered in the outdoors, at different rates and with different results, based on where the machines were used. Now that I've hopefully made a successful case for understanding that different people, painting different machines, at different times and places, even though using the same paint, achieved different results, let me describe the logic behind the idea of scale color. To do so, I will borrow shamelessly from David Klaus' amazing book, IPMS COLOR CROSS-REFERENCE GUIDE, on painting models. Have you noticed the phenomenon called atmospheric perspective? This is what we experience when we view objects in natural light, in the immediate foreground, the middle distance, and far away. Because the atmosphere through which we are looking is not perfectly transparent, the farther away an object is from our eyes, the grayer, in general, the colors of the object become. Renaissance artists exploited this phenomenon when they painted landscapes, achieving a sense of depth in their paintings by adding gray tints to the pigments they used to paint the more distant objects in their compositions. You can demonstrate this phenomenon for yourself by following these directions: cut out two squares of cardboard, one square at 12" x 12" and the second square at 1" x 1". Paint both squares flat black, using the same paint at the same time. Once dry, note how the 1" x 1" square exactly matches the 12" x 12" square, one on top of the other. Now, take both cardboard squares outdoors on a sunny day. Attach the 12" x 12" square to a vertical surface, in the direct sun. Holding the 1" x 1" square in your fingers, at arms length, back away from the 12" x 12" square. Stop backing away when the 1" x 1" square appears to be the same size as the 12" x 12" on the vertical surface. You should be able to see that the 12" x 12" square is noticeably lighter that the 1" x 1" square in your outstretched hand. This is the result of the different amounts of atmosphere, between the square in your hand and the square some distance away. When you look at a 1/72 scale model of an A-10 Warthog, as an example, from a distance of 12 inches, this simulates the same experience as looking at a real A-10 from a distance of 72 feet. Another way to say this is to imagine that you are holding a 1/72 scale model of an A-10, twelve inches away from your eyes, while you are standing 72 feet away from a real A-10. The two A-10s would appear to be the same size, from your perspective. However, while you have only twelve inches of atmosphere between the model A-10 and your eyes, you have 72 feet of atmosphere between you and the real A-10. If the model has been painted with model paints that exactly match the colors on the full size A-10, these model paints are going to look too dark and too vivid, compared to the colors of the real A-10 in the distance. My approach is a little different, because my goal is to strike a balance between, on the one hand, attempting to be as accurate as is reasonably possible with the paint and, on the other hand, ending up with an attractive model, when I'm finished. I usually will assemble the correct model paints for the subject, if that is possible, and brush paint samples of these colors, on white sheet plastic. I will then compare the samples with the reference materials I have for the subject, including my book of Federal Standard FS 595a colors, a publication available for ordering from the U.S. Government, containing over 450 paint chips matched to U.S. Government standards. Many kit manufacturers will refer to FS 595a, when specifying the colors to use on their kit. With all of the full-strength paint samples before me, I start to make a judgement of how much all, or some, of the paints will need to be lightened with white paint, to achieve the scale color effect I'm after. I add a little white to each color, painting out a new sample as I go, waiting for the sample to dry, before I add any more white. (Wet paint is generally much lighter-looking, than dry paint.) The critical judgement comes from comparing the various lightened samples to each other. I'm more concerned with how all of the colors look, together as a group, than I am with what percentage or ratio of white paint I'm adding. 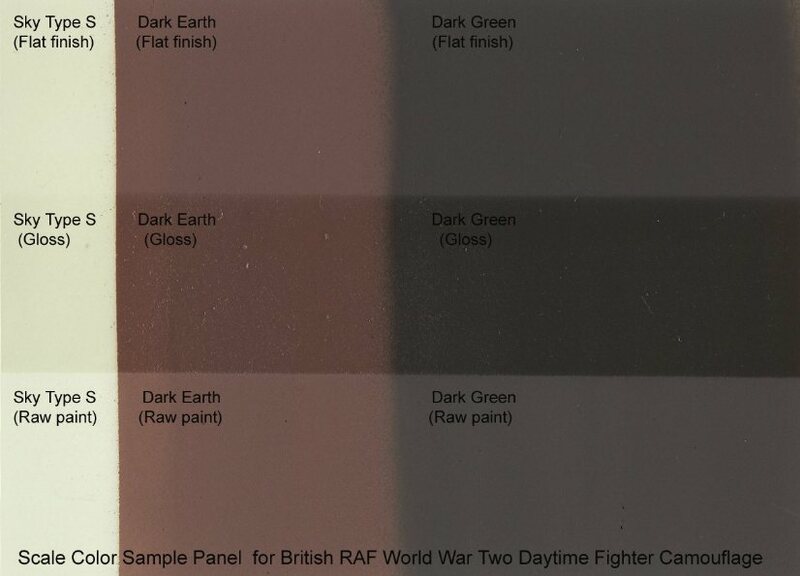 As a practical example of this process, if I am lightening camouflage colors for a British fighter from World War Two, I will lighten the Dark Earth and Dark Green for the upper surface camouflage a lot more than I will lighten the Sky Type S for the undersurface camouflage, because I know from experience that I don't want the contrast between upper and lower to be too strong. When I believe I have lightened the colors enough, I will used the mixed paint to airbrush the colors on to a new, white plastic sample sheet. This is necessary because I know from sad experience that paint-brushed paint and airbrushed paint can look quite different. The photo-recon blue undersides of my SAAF Buccaneer was an instance of that phenomenon. Once the airbrushed sample is dry (at least overnight), I mask one third of all of the colors of the sample, to maintain a specimen of the raw colors, and airbrush a heavy coat of Johnson's "Future" acrylic floor wax on the exposed two thirds. I do this because later, I will be airbrushing the entire model with Future, to provide a smooth, glossy surface, to prevent "silvering" when I apply the decals. The Future clear gloss causes a permanent, darker, "wet" look to the flat finish of the Humbrol model paints, that is not completely counter-acted by the final, clear, flat overall finish. I know to take this darkening effect into account, as I am lightening the Humbrol paints. The last step with this paint sample panel is to mask half of the Future-coated paint, and airbrush Testor's Clear Flat Lacquer over the exposed Future glossy finish, to see how the final appearance of all of my mixed paints will appear on the finished model. If you study the scan of the color sample panel above, you can see the interesting interaction between the paints, the clear gloss and the clear flat. One topic to acknowledge, here: for all my efforts to achieve scale color with the paints I use, I have no control over the colors of the decals I apply. The decal colors are at the discretion of the decal manufacturers, and I have no option but to use what is available to me. Fortunately, especially with the most recently produced decals, I have read that some decal manufacturers take scale color into account, when they design their decals. 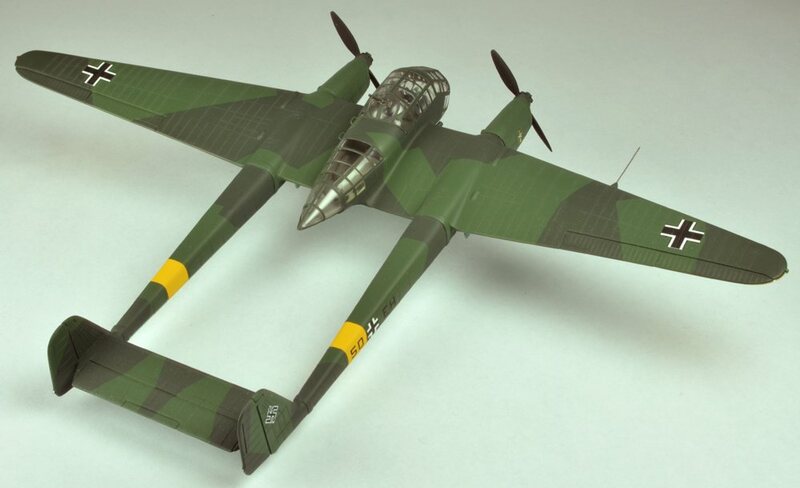 My first model with "scale color"
This Airfix Focke-Wolf FW-189 Uhu was the first model I painted with Humbrol paint that I had lightened with flat white to achieve scale color. I attempted this because I had just bought a copy of The Official Monogram Painting Guide to German Aircraft 1935 - 1945, and it contained a discussion, the first I had ever read, of the concept of "scale color". I thought it made sense, and I certainly thought that most of the models I saw on display at various IPMS model contests looked too dark. 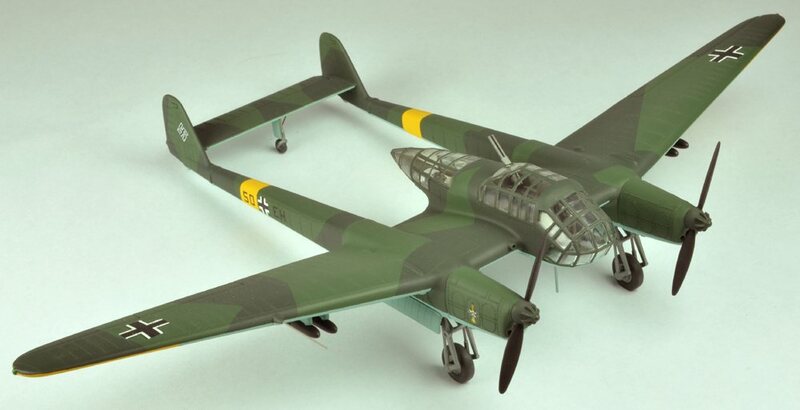 I used the camouflage diagram for FW-189s from page 124 of the Guide, to mask the camouflage pattern on the model. The Airfix kit was pretty old, late 1960s-early 1970s, I think, and had much too heavy rivet detail, but I wasn't savvy to that issue, yet, and so didn't think to sand down the rivets a little. This is especially apparent where the decals were applied and distorted by the rivets underneath. Fortunately, I had evolved to installing the landing gear in the down position, instead of my earlier fascination for inserting a pilot and assembling the landing gear up, so I could fly my model around the room, going "brrruuuummmm..."